Porsche Design Shakepen – expensive novelty? The Porsche Design Shakepen is a compact ballpoint with a unique flick-action. Nib extension and retraction is affected by a simple, gentle flick of the wrist. The mechanism is surprisingly reliable (although, perhaps not, considering the Porsche’s reputation!). The mechanism operates by inertia with a bob weight that creates a surprisingly heavy pen for such a small physical size but equally gives a presence for such a diminutive pen. The flick-pen is currently available in 2 finishes from PenFountain.com, the popular rubberised, striated finished Caoutchouc and the all-metal Twist. Both are very practical pens offering small stature without the clutter of a small operating mechanism often found to be difficult to operate for users with larger fingers. With typical Porsche Design attention to detail, the Shakepen features a raised branding badge on the upper section that doubles as roll-stop to prevent your pride and joy rolling off the table when not in use. The Porsche Design uses the industry standard D1 sized refills available from a number of manufacturers including Monteverde that offers to D1 in 2 line widths. The Shakerpen is a fun pen offering a certain style and presence. Does it represent value for money? Porsche Design pens are a premium priced pen with style and quality to match. The Shakerpen is effectively Porsche Design’s entry level pen in the current line-up and, in that context, the pricing is probably about right and is certainly on par with compact pens from other luxury pen brands. We still offer a range of inked pens for young students to try in our retail outlet, PenFountain@Beales in Worthing West Sussex. The number of early-learners coming into the PenFountain.com shop in a distressed state to buy their first ‘proper’ pen are a disappointment to us – not to mention their parents! What should be an exciting milestone in their development has been tainted by their teachers’ response to their ‘disability’. In common with about 7% of the UK population, they are left-handed. “Teacher says … hold this pen or that pen and get used to it.” This should be a time to encourage, to excite, to develop a love for writing, for words, for spelling, for grammar, not a time to put obstacles in the way. At PenFountain.com we keep a range of inked pens in a pencil case for youngsters to try, both left-, and right-handed. Time for a digitally driven fountain pen nib? The principles of the fountain pen have been established and refined over the last 150 years. Put simply, an ink reservoir feeds ink into a delivery tube, through a series of capillary tracts, through to the tip of the nib, where contact with the writing surface causes the ink to be deposited. Although a fairly crude process by comparison to the writing technologies of today, the fountain pen, either because of its idiosyncrasies or in spite of them, remains the most rewarding way to put words onto paper for others to read. Much has been written about the attributes of different styles of nib fabricated from almost every conceivable type of resistant material but, ultimately, beauty remains in the eye of the beholder. At PenFountain, what is very clear is that the current trend towards one-size-fits-all ‘medium’ nibs is eroding the very market that the fountain pen works for. When asked for advice about pens with alternative nibs, sizes, and formats, the conversation invariably contains the caveat ‘without spending a fortune…’, to which only one reply is currently available, Lamy. Regular readers of my blog will be familiar with my faith in Lamy’s interchangeable nib system with its low cost and reliability. However, even with its greatness, the design of the Lamy pen range can be a little too contemporarily radical for what may be described as an inherently conservative market. In an ideal world, perhaps the solution could be to put the Lamy nib system into pens of a slightly more conservative style such as, Waterman. Keep the price below £50 and you could have a commercial winner. While we’re designing the perfect commercial fountain pen, the range could possibly be extended to include some oblique nibs. We have been surprised at the number of fountain pen users requesting italic and oblique nibs and, even with Lamy’s ‘calligraphy’ pen nibs, which are technically italic, the 1.1mm nib does not offer sufficient variation between major and minor line widths and yet the 1.5mm major line width tends to suit people with larger writing. Conversely, the broad italics and obliques from the other major players tend to be neither wide enough and, being predominantly18ct gold, too expensive. We understand the issues associated with production costs, tooling, and economies of scale but surely in the age of CNC manufacturing it would be possible to develop a digitally controlled tool to create a range of nibs that meet the fullest market requirements without prohibitive cost? Would this be your ideal solution? Please let us know. London 2012 – No pens but great Filofax! The UK pen industry has proved a little reticent in producing celebratory mementoes for the forthcoming London Olympics. This may be a reflection on the fact that there are only 2 significant truly British manufacturers. However, we might have assumed that some of the other manufacturers with a strong UK presence may have stepped into the breach creating a product of suitable quality as a long-term keepsake of the occasion. In context, we understand that the licence fees associated with the use of Olympic design media, and even the use of ‘2012’, in a commercial application is prohibitively expensive and, straying from the tight constraints of any agreement, will result in a visit from the Olympic Stasi with powers to confiscate and fine. Despite these hurdles there is one British manufacturer that has taken the plunge – Filofax. The British diary and organiser publisher has created a range of products using Olympic motifs, the star of which is the Filofax London 2012 Union Flag organiser. This is a stylish, (and its not often that you can say that about a memento!) 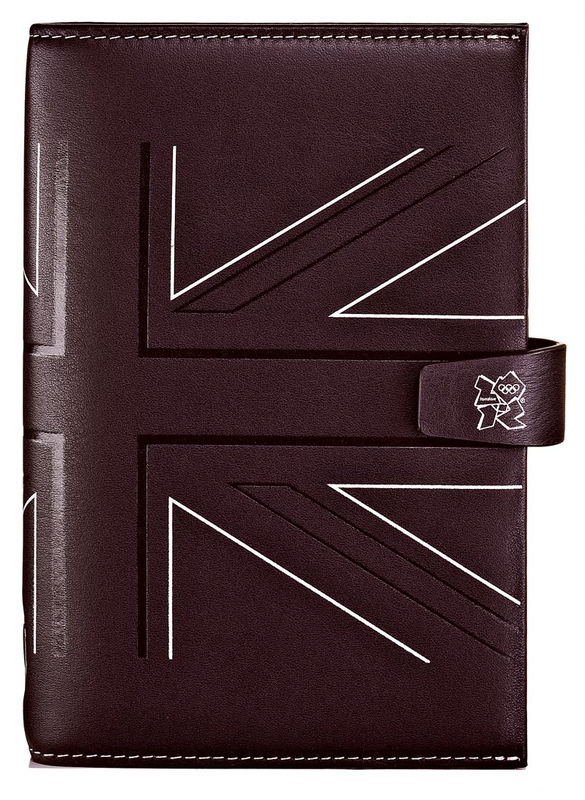 chocolate brown, nappa leather bound, Personal sized organiser with an embossed line Union Flag wrapped around the cover and discreet London 2012 logo on the closing tab. This organiser represents something that is both practical and collectable. At £90, the premium price reflects the uniqueness and quality of this desirable memento. However, for those with a lower budget, there are also the Sporting Icons organisers in Pocket and Personal sizes for £27.00. These are full organisers bound in faux leather and feature matrices of sporting event icons with ‘London 2012’ in the official Olympic type style. From a pure PenFountain perspective, these are not pens. However, if you want a discreet and collectable memento of this once in a lifetime event, the Filofax London 2012 range is definitely worth a thought. The Filofax London 2012 range is available from both www.PenFountain.co.uk and from our retail store, PenFountain @ Beales, Worthing, West Sussex. How do you choose your next pen? Buying a pen, particularly a fountain pen, can be a very personal experience. The price, the style, the nib and even the presentation can be a determining factor. At PenFountain, we are currently experiencing the Rolls Royce for a Mini price scenarios on the retail front. A £5.00 pen in a velvet lined cardboard veneered case so that it the looks the business (but it’s a lie!). For fountain pen users, without a doubt there are some fine ‘gems’ to be found below £10 – without the presentation case but, for collectors, these are often the little extras for selection from a pot of pens on the desk. When it comes to buying the more serious pens, is it hearts vs. heads on price and appearance or is it all in the brand? We are conducting a short poll – please feel free to complete the poll and comment. In the days when apple and blackberry were generally accepted as types of fruit and mobile phone was almost an oxymoron, the Filofax was king. No self-respecting yuppie would be seen without their trusty organiser tucked under their arm. The bigger the Filofax the more self-important they were perceived as being. Against this back-drop there were other brands of organiser offering a similar list of inserts but some had moved time management into a more sophisticated arena offering training courses to help managers optimise their time. The concept is relatively simple. Using either A5 or A4 sized organisers, you use the day per page with appointment times as your detail timings, the week to view as your bigger picture and your month to view as your project-planning format. Notes could be kept relating to each meeting attended and all of your contact details would be stored in the appropriate section. Key to the success of the process was to even book time for yourself and refuse to take phone calls at certain times of the day. In principle some fine ideas but in reality to take the concept at its full value you needed to plan in time to plan everyday and very few of us could afford to refuse to take an instruction from a customer or superior and not taking phone calls was open to misinterpretation. Negatives aside, the concept was at least thought-provoking with a significant number of ideas being incorporated into daily business life. Jump forward 25 years and many of the concepts being promoted at that time are relevant today. Even with the development of the mobile phone with its PDA (Personal Digital Assistant) capabilities it is operated by a basic on-off principle. Digital equipment of any description doesn’t do ‘about’ or ‘nearly’ or ‘something like’ but humans do. Enter the 21st Century Filofax. Used in conjunction with a mobile phone, you can keep your diary with you all the time and working in pencil you keep a basic record of appointments giving you an overview. The detail can be transferred to your PDA with details of all participants, locations, and associated information. But making that first appointment in a room full of colleagues, a flick back and forth through several months of a diary is much more efficient than scrolling through screen after screen of minutiae. An exchange of business cards is a simple case of slipping it into your Filofax for safe keeping before transferring to the PDA in the peace of your office. When planning a project, a few simple continuity lines linking days or notes in a margin can indicate that there is ongoing, long-term work as well as the day-to-day appointments. If it doesn’t happen for in whatever reason, you can simply extend the project line without creating a rigid framework that involves major redesigning of your plan. There can also be the added notes like, ‘don’t forget the wedding anniversary’ without the audible alert at 10 am on the day before that you simply turn-off and forget again! There remains a great opportunity to be able to combine digital technology with traditional Filofax-like planning to get the best out of life. Filofax products are now available on-line from PenFountain.com and in our retail concession PenFountain @ Beales of Worthing. Waterman has a penchant for subtly revising the style of their products. The styling change can be difficult to identify for the average user, particularly without the alternative style for comparison. In terms of nomenclature, whilst at best the company adds a suffix denoting the year of the revision (helpful only if you’ve kept the original slip case) and, at worst, not even telling their colleagues! Customers love and cherish their pens and, from time to time, may require a new nib but have the devil’s job trying identify which model they own. A couple of recent cases confirm this scenario. The Waterman Hemisphere enjoyed a facelift towards the end of 2010 – the model helpfully known as the Hemisphere 10. The barrel was slimmed down by about ½ a millimetre and with its revised profile making the pen appear more slender than its predecessor. Move forward a few months and the demand will start to rise for replacement nibs. The nib units between the original Hemisphere and the 10 are incompatible and therefore we need to identify which is which and ensure that the customer receives the correct nib. In this case, the decorative band on the 10 is significantly wider than the earlier model making life a little easier. Replacement nibs for both types are now available (subject to stock) in a range of widths and either chrome or gold plated finishes on PenFountain.com. However, there are models that, without the help of comparative illustration and key differentiators highlighted, for the occasional user identification of their pen can be something of a nightmare. At PenFountain we have produced a guide showing some of the different model features to help identify Waterman models. The second type of model revision alluded to in the introductory paragraph is represented by the Waterman Perspective. On this model, presumably for production reasons, the threaded portion of the front-end nib assembly has been lengthened rendering it incompatible with the majority of barrels in circulation without notification to anybody outside the customer service area. 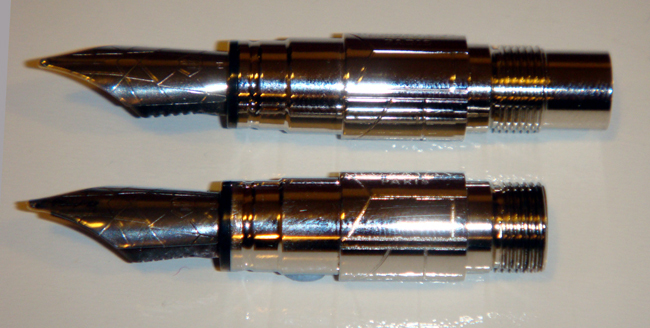 The replacement nibs were simply withdrawn and then eventually replaced with the newer, incompatible versions! After further enquiries, we have identified that if a customer requires a replacement nib, Waterman will replace the barrel section as well, at their discretion. This becomes a very time-consuming process requiring the complete pen to be returned to Waterman for ‘refitting’ of the nib. Therefore, we have had no alternative but to withdraw the Perspective replacement nibs from our standard offering. However, if you have a perspective requiring a replacement nib, please contact us and will explore the options with you.